A syringe body fitted with flexible tube and dilute sodium hydroxide (NaOH) (or potassium hydroxide, KOH) solution can be used to quickly estimate carbon dioxide percentage for field purposes, as NaOH absorbs CO2 but not methane. This is not exact as there may be some CO2 remaining in the gas phase. Prepare approximately 100 ml of dilute sodium hydroxide solution by dissolving a couple of granules (about the size of a field pea) of NaOH (or KOH) in about 100 ml of water. Actual chemical concentration is not critical in this analysis. “Lye” and “Caustic Soda” are other names for NaOH. 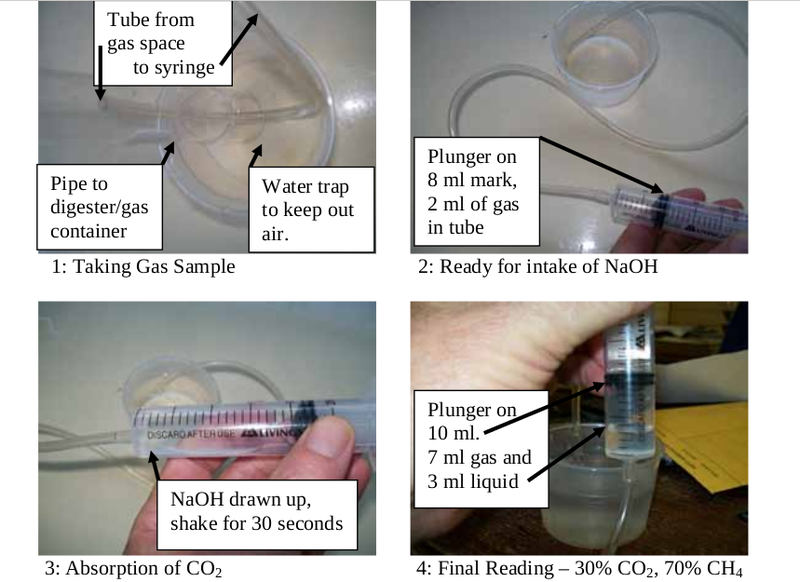 Draw up a 20-30 ml sample of biogas into the syringe (I initially fill the syringe with water to reduce air contamination and use a water trap to keep air out of the gas line) and put the end of the tube into the NaOH solution. Now draw up approximately 20 ml of solution and keep the end of the tube submerged in the NaOH solution while you shake the syringe for about 30 seconds (until the liquid level stops rising). Point the syringe downwards and push out excess liquid, so the syringe plunger reaches 10 ml. Now read the volume of liquid, which should be 3-4 ml indicating about 30-40% of CO2 gas absorbed (so we assume the balance of 70-60% is methane). If the flame does not burn properly and you get over 50% methane (a reading of less than 5 ml of liquid) you must have nitrogen or some other gas present (or too much gas pressure). Note that combustion is sometimes possible at less than 50% methane. It is good to see a technique I developed being promoted.